Beverly Agtuca was born in New York, but has family in the Philippines, a country that struggles with malnutrition and undernourishment. Her overall goal for her research is to help countries that struggle with undernourishment by increasing the agricultural productivity in those countries. Agtuca graduated in 2014 with honors in Biotechnology and a minor of Microscopy from the State University of New York College of Environmental Science and Forestry (SUNY ESF) in Syracuse, NY. 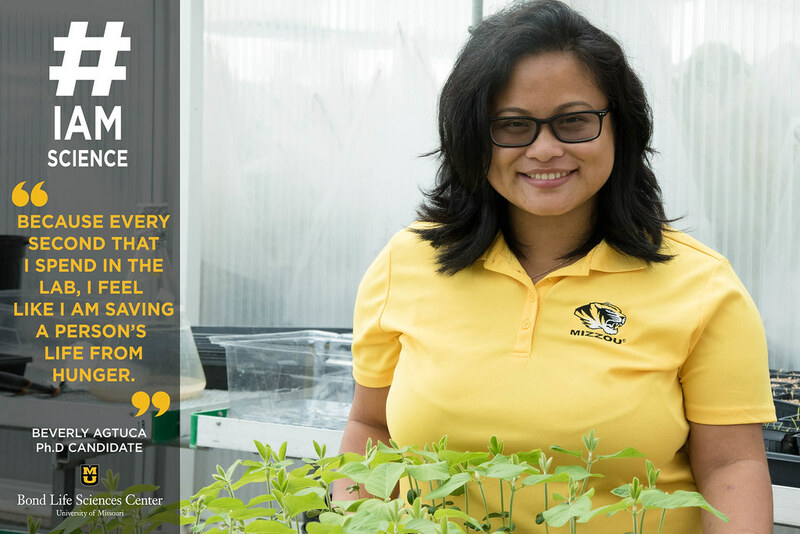 She’s currently a Ph.D. candidate in plant breeding, genetics, and genomics at MU. She chose to come to Bond LSC because of the community and Dr. Stacey, her supervisor and mentor. Ever since coming to MU in 2014, Agtuca has been keeping busy. In June, she received a travel award to go to the American Society of Plant Biologists (ASPB) in Hawaii. The International Society for Molecular Plant-Microbe Interactions (IS-MPMI) also awarded her a travel award to attend the 2016 meeting in Portland, Oregon, where she gave an oral and poster presentation. She also has two original research publications under her belt and is currently working in Dr. Gary Stacey’s lab at Bond LSC. The research for her dissertation is focused on the relationship between rhizobia and soybeans. She collaborates with scientists at George Washington University (GWU) in Washington, D.C. and the Pacific Northwest National Laboratory (PNNL) in Richland, Washington to enhance the capabilities of the 21 Tesla Fourier transform ion cyclotron resonance mass spectrometer (21T FTICR) through application of laser ablation – electrospray ionization mass spectrometry (LAESI-MS) technology that can analyze the contents of single plant cells. This 21T FTICR machine was recently installed at PNNL and represents one of only two such machines in the world. This is revolutionary because few people do single cell analysis. Usually, scientists deal with the law of averages, which dilutes the final measurements. But this technology gives an in-depth glimpse into a single cell so scientists can obtain a more comprehensive bigger picture.